November 14, 2018 By This post may contain affiliate links. Stuff these freshly baked Crescent Roll Cornucopia with Cranberry Turkey Salad for a Thanksgiving brunch or lunch. Your family will love this festive holiday meal. What do you do with all your leftover turkey on Thanksgiving weekend? 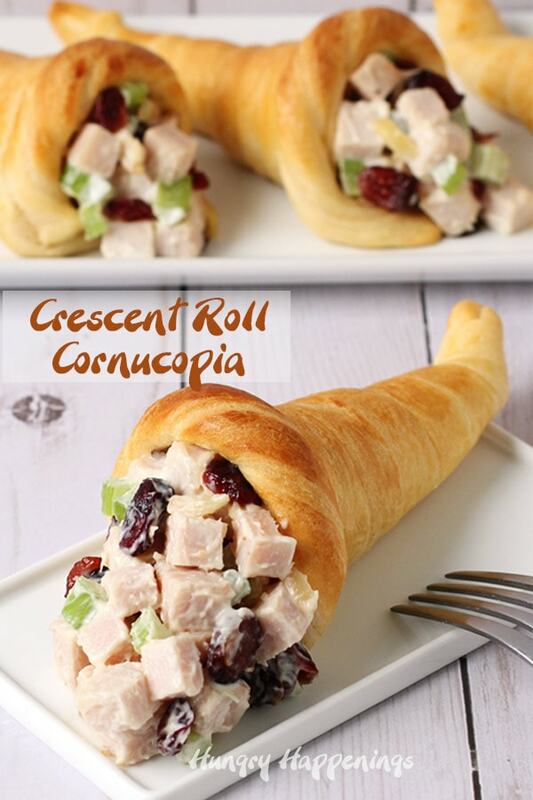 I love to dice some of the white meat and toss it with dried cranberries, celery, toasted almonds, and mayonnaise then stuff it inside freshly baked Crescent Roll Cornucopia to serve for brunch or lunch. I baked up my first batch of these crescent roll cornucopia back in 2013 after my Crescent Roll Carrots became really popular. 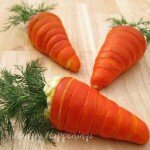 So many of you made those carrots that I figured you’d enjoy a similar recipe for Thanksgiving. When I made the carrot shaped crescent rolls I wrapped strips of Pillsbury Crescent Dough Sheets around metal cream horn forms then colored them with some orange food coloring and baked them until golden brown. 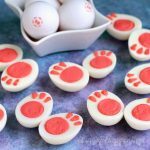 I served them filled with egg or ham salad. 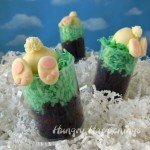 These made for a really unique meal to serve for Easter and I knew I could use a similar technique to make cornucopia shaped crescent rolls for Thanksgiving. The cornucopia are made just like my Crescent Roll Carrots but instead of using a cream horn form to shape my crescent rolls, I covered some sugar cones in tin foil then wrapped the crescent roll dough around them. 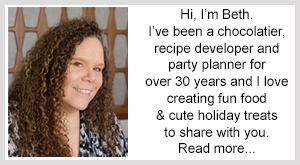 I realized that although cream horn forms are really pretty inexpensive that many of you might not want to purchase them for one recipe or project. So you can grab some sugar cones and non-stick tin foil instead. Cut off a piece of non-stick tin foil and set the non-stick side facing the table. 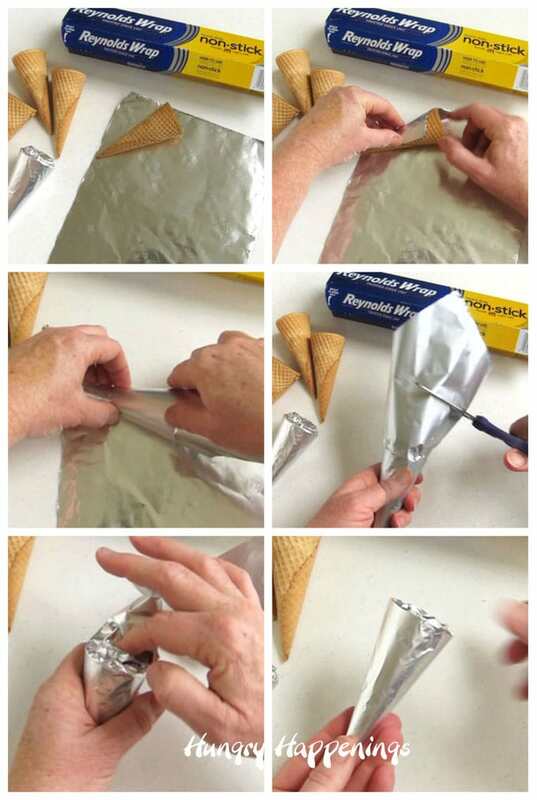 Place a sugar cone at an angle in one corner and begin wrapping the foil around the cone. Roll the cone towards you until it curves around and is completely covered in tin foil. Cut off all but about 2 inches of the foil that comes out over the opening of the sugar cone. Push the foil down into the cone. 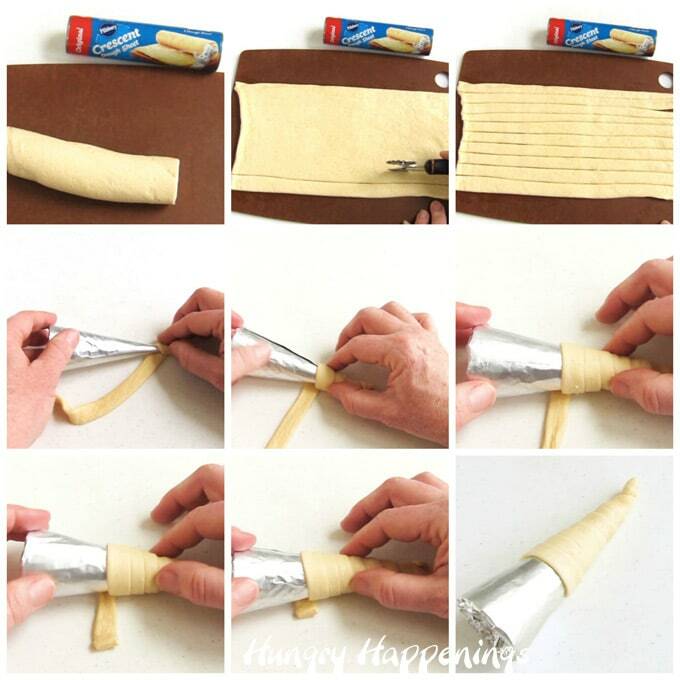 Open and unroll a Pillsbury Crescent Roll Dough Sheet tube. Cut the dough into a rectangle. Cut 8 strips from the dough. Cut 2 of those strips in half. Wrap the 6 full size strips around the tin foil wrapped sugar cones. Start by wrapping the end of a strip around the pointed end of the cone, leaving a bit of dough hanging off the end. Continue to roll the cone wrapping it in dough, stretching the dough while you roll. Press down on the end of the strip making sure it is attached well. Add a braid of dough around the opening (see below). Add a braided band around the cornucopia. Twist two of the half sized strips together then cut that into three pieces. 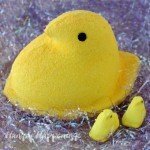 Beat together 1 teaspoon of water with an egg to make some egg wash.
Brush a light coating of egg wash around the edge of the crescent roll cone then wrap one of the twisted strips around it, cutting off any excess and pinching the seams together. Line a baking pan with non-stick tin foil. Set the six crescent roll wrapped cones on the pan. Curve up the tip of the cornucopia. If you’d like your cornucopia to have a curved tip, roll up some tin foil and set it under the tips. I found it easiest to cut pieces of the tin foil then fold in the rough edges so you have a nice smooth piece to work with. Then wrap the foil around a pen. Remove the pen and set the tube of foil under the tip of the crescent roll. You may need to flatten the foil slightly to get the dough to stay in place. Brush the tops and sides of the crescent roll cornucopia with egg wash. This will give the dough a shine once baked. Refrigerate the cornucopia for 30 minutes. This will ensure the crescent dough will bake up nice and fluffy. Bake the cornucopia for 10-12 minutes until they are golden brown. 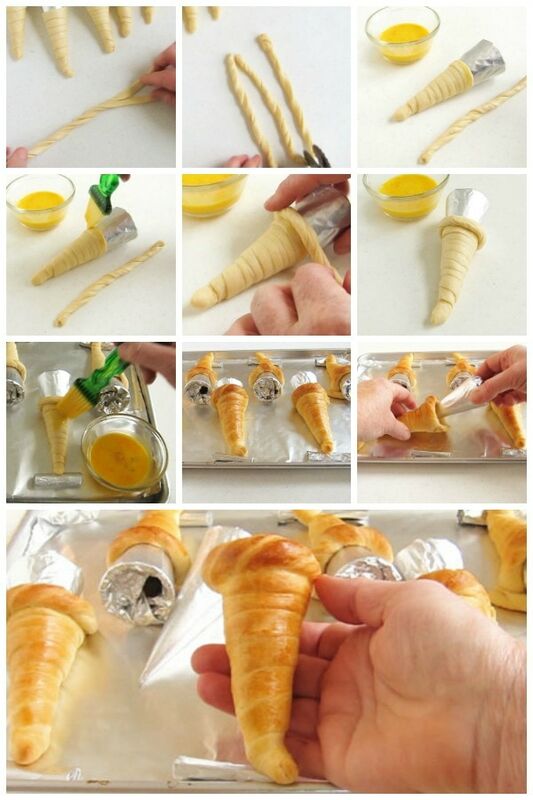 Remove crescent rolls from cone. Gently hold the crescent roll cornucopia and pull the sugar cone out. You can store them for up to a day in an airtight container but they are best served the day they are made. Dice about 3/4 of a pound of turkey into small cubes. Combine the turkey with dried cranberries, chopped celery, toasted almond slivers, and mayonnaise or Miracle Whip. Fill the cornucopia with the turkey salad. 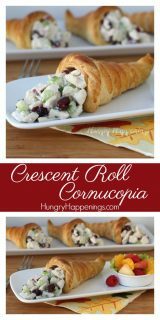 Place a crescent roll cornucopia on a dinner plate and add more turkey salad so that it looks like there is an abundance of food flowing out of the opening. NOTE: These taste best if filled just before serving but you can fill them and refrigerate them for up to a day. 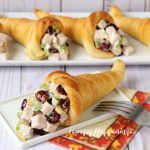 Wrap strips of crescent roll dough around a cone to create Crescent Roll Cornucopia that can be filled with Cranberry Turkey Salad for Thanksgiving brunch or lunch. *To toast almonds heat them in a 250 degree oven for about 8 minutes until lightly golden brown and fragrant. Unroll dough then cut into 8 long strips. Use 6 of those strips to wrap around either cream horn forms or sugar cones that have been wrapped in non-stick tin foil. Cut the remaining two strips in half lengthwise. Twist two of those strips together then cut into three equal lengths then repeat with the other two strips of dough. Whisk together the water and egg then brush the egg wash over the opening of each crescent roll cone and wrap one of the twisted strips around that edge. Set the cone on a tin foil (preferably non-stick) lined baking sheet. If desired set the tip of the cones under a roll of tin foil. Repeat making a total of 6 crescent roll cornucopia. Brush egg wash over the tops and sides of each crescent roll cornucopia. Let cool for 10 minutes then gently twist them off the foil lined cones. Toss together the diced turkey, dried cranberries, celery, toasted almond slivers, and mayonnaise. 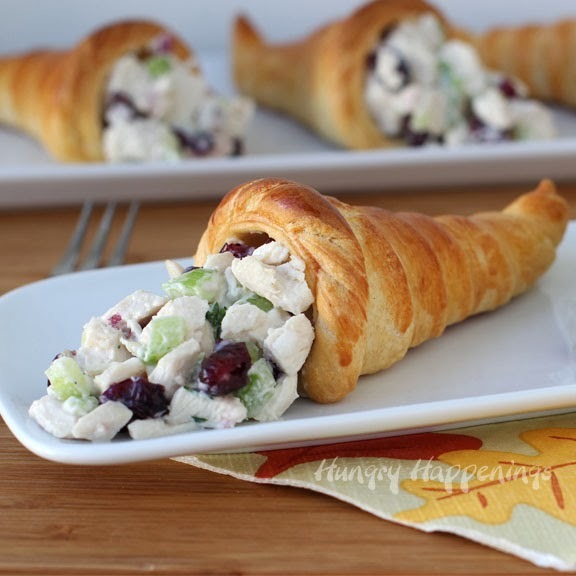 Spoon some of the turkey salad into a crescent roll cornucopia then set it on a plate and add more turkey salad coming out of the cornucopia. These are best served the day they are made but can be refrigerated for up to a day. You can bake these crescent rolls in advance and store them in an airtight container for a day. Refrigerate the turkey salad until you are ready to serve the cornucopia. You can see another version of this recipe over at Tablespoon.com that I originally posted in November 2013. 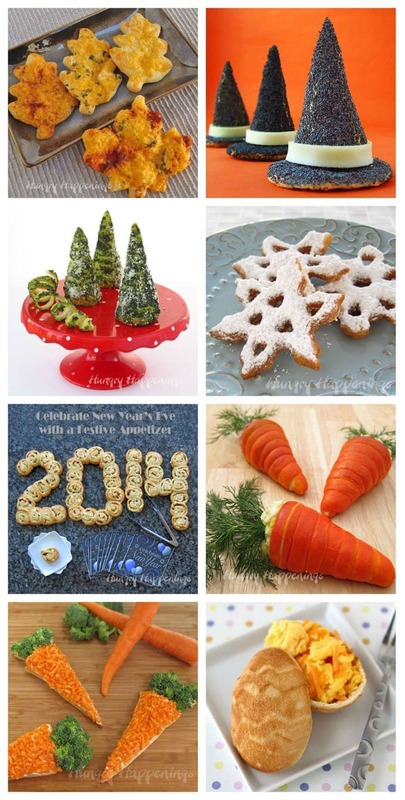 You can also use the same dough to create these other festive holiday crescent roll recipes. 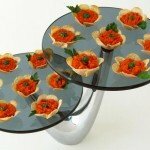 Beth, these are so beautiful – what a WOW factor on any table! Love this idea, not only is it beautiful but great way to use up leftover turkey. I always put cranberries in my chicken salad so this recipe is perfect! 🙂 YUM Pinning! That is so impressive! What a great presentation and I was thinking how lovely that would be at a fall bridesmaid luncheon! Yum, I'm going to pin it. I also added you to my g+ friends. Thanks for pinning and joining me on Google +. This could also be made as a dessert by brushing it with melted butter and shaking on sugar and cinnamon before baking then filling it with yoghurt or custard or ice cream and fruit. 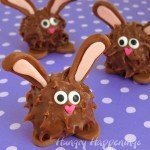 I have been missing all your cute and delicious creations! I loved your orange carrots and your cornucopias are adorable!! Happy Thanksgiving, Beth! I was out of the country for three weeks in October so things have been a bit slow around here recently. I’m glad you stopped by to check out these Crescent roll Cornucopia. I hope you have a wonderful Thanksgiving too. Loved the easy instructions for the cones for the salad. Great idea and can see many uses for it.